At the Bridgend factory of orthopaedic implant manufacturer, Biomet, acetabular shells for replacement hips are turn-milled from titanium bar in a quarter of the time it used to take a decade ago. It is because they are now produced on a twin-turret B-axis lathe from INDEX, Germany, supplied by UK agent, Kingsbury, whereas previously they were machined on conventional CNC lathes. In 2002, Biomet acquired a Swiss implant manufacturer and inherited an INDEX G200 CNC lathe with an upper, 360-degree, B-axis turret. 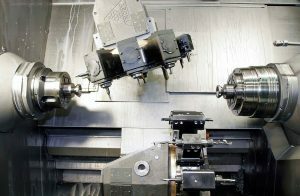 It is two-sided; on one face are 10 live tool stations and on the other a milling spindle served by a toolchanger outside the machining area. There is also a conventional lower tool turret with 10 live stations. The machine was shipped to Bridgend to take over acetabular shell manufacture from the original lathes. The latter had the significant disadvantage that insufficient tool positions in the turret meant that a drill needed to be adjusted manually three times during each cycle to produce three holes at different angles in each shell. The INDEX lathe from Switzerland avoided the problem, as the B-axis turret could drill all three holes without manual intervention and complete the cutting cycle automatically, approximately halving the cycle time. The production process involves feeding titanium bar by hand through the spindle. Even though the lathes were built in the mid-1990s, they have continued to hold tolerance and still provide a consistent, capable manufacturing process for shells up to the machines’ maximum through-spindle capacity of 65 mm. Dimensional accuracy is 25 to 50 microns total. By 2009, larger sizes of shell had been added to the product range. So a bigger capacity INDEX G300 twin-spindle turning centre was purchased. It is equipped with high-pressure (50 bar) through-tool and flood coolant for efficient titanium cutting, and a Siemens C200-4D control. This time, Kingsbury applications engineers suggested a way of doubling productivity by feeding titanium bar into both spindles and producing two shells at the same time. A spokesperson for Biomet Engineering.